Heat your pan until fairly hot, then add butter and garlic and keep stirring so the garlic does not brown and turn bitter. Add your seafood and continue stirring, then add all remaining ingredients and cook until the seafood is done. You will want to have all ingredients handy, as you need to work quickly. If it's shrimp, they are done when they curl and turn pink and if it's langoustines or crab, they just need to be heated through. It's 2-3 minutes max. Then remove the seafood with a slotted spoon and set aside in your serving plates and then reduce the sauce down by half and pour over the seafood and serve. You will love it and Buck will be proud. Just like the author of this article, I found my type of seafood, Norfolk style at Chrisfields, in DC. 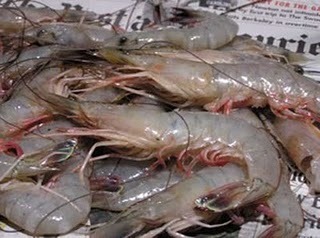 Will try cook that style at home and in my favorite seafood restaurants. The World Famous "Sunday Sauce"